Today, United States Citizenship and Immigration Services (USCIS) and the United States Department of State (DOS) announced new procedures for determining when applicants may file their applications to receive permanent residency in the United States. 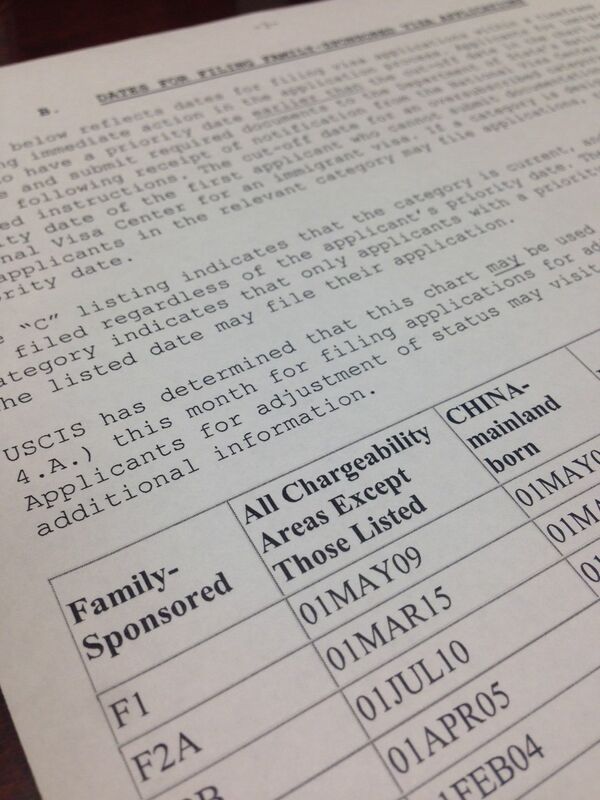 The changes will be reflected in a new monthly Visa Bulletin, published by DOS. Previously, the monthly Visa Bulletin provided only one set of dates: the priority dates which had become current (i.e., available for an immigrant visa number) for each family-based and employment-based immigrant preference category. An applicant whose priority date is earlier than that cut-off date has an immediately available immigrant visa number. Now, the Visa Bulletin will also provide a “filing date” for each family-based and employment-based preference category, in advance of when the priority date is actually current. When an applicant’s priority date is earlier than this filing date, he or she may submit an application, either to USCIS for adjustment of status, or to DOS for immigrant visa processing. This will permit cases that are not yet current, but are near current, to be received and processed. Applicants whose priority dates are earlier than the filing date for their category will not be able to receive a decision on their case until their priority date is actually current and a visa number is available. However, USCIS and DOS hope that opening specific dates for filing, in advance of when immigrant visa numbers are available, will help streamline the issuance of visa numbers and make it easier for the agencies to predict how many visa numbers will be used each month. If you believe your priority date is near current and you may now be eligible to file your case, or if you have other questions about your priority date, please contact Kolko & Associates, PC.